FILE THIS UNDER: sometimes in the tiniest of books – resides the biggest magic. 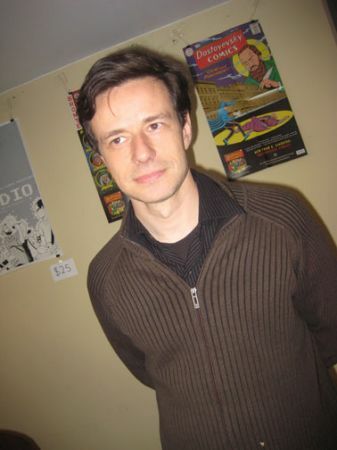 RON REGE Jr. at the first ever BROOKLYN COMICS AND GRAPHICS FESTIVAL. WILLIAMSBURG. 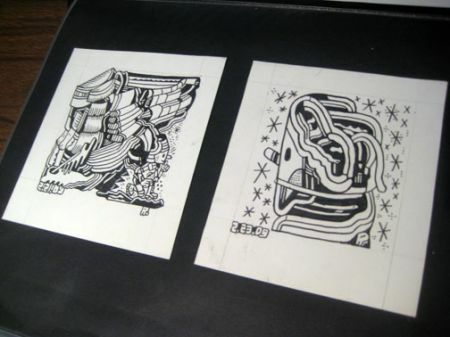 apart from his hardcover DRAWN AND QUARTERLY books – Ron Rege Jr. had some arresting black and white sheets. these turned out to be studies from his – DIY mini books !! 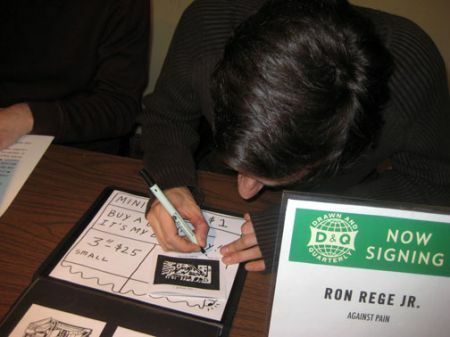 they were in a limited editions of 100 and sold for $1 apiece – of, course I scored one – and here is Ron signing it !! it is about 4 in. square !! well, 1/4 in. more on the width, 1/4 in. less on the height !! held together with one staple in the center – it is 3 sheets or 6 pages altogether. is is dated 4.29.09 and the title says: ‘WHAT IS NOW WHAT IS NEW WHAT IS IT ??? believe, that block to the left – is his name – logo. what really drew me to the book – apart from its DIY: little book – big excursion into the world. of thought. 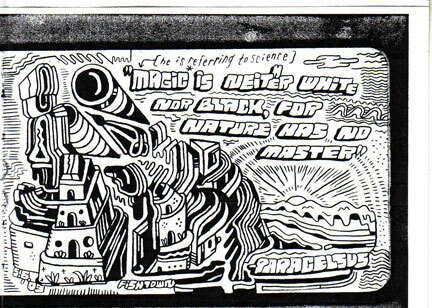 not to mention the sub-texts of graphic art & design !! and, did we mention, charm. was the cross-over into graff. at first – the message seems to be the opposite of Noah Lyons ??? except you’ll note that that message – is in the shape of a hand gun !! RAY OF LIGHT WANTS TO SHINE ON YOU! OF LIFE – IN PREPARATION FOR DEATH? he also exposes some of his own polar opposite – issues !! incl. stylististic !! 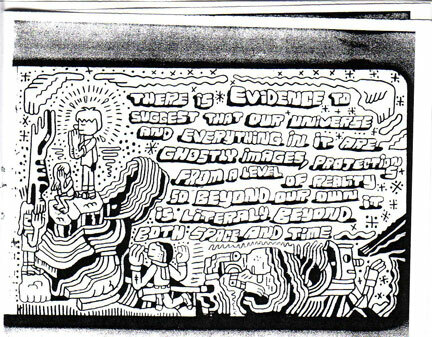 THERE IS EVIDENCE TO SUGGEST THAT OUR UNIVERSE AND EVERYTHING IN IT ARE GHOSTLY IMAGES, PROJECTIONS FROM A LEVEL OF REALITY SO BEYOND OUR OWN IT IS LITERALY BEYOND BOTH SPACE AND TIME. here’s that last page – writ large !! 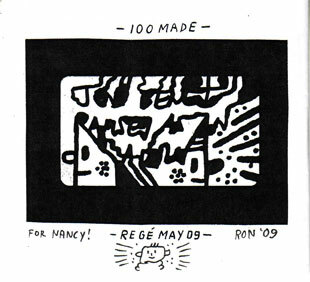 the back cover – with the RON REGE JR logo – name block. 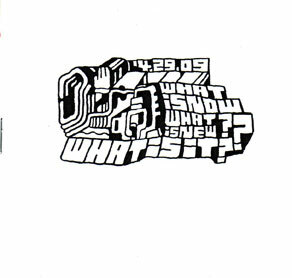 SCANS from: RON REGE JR – 4.29.09 / WHAT IS NOW WHAT IS NEW WHAT IS US ?? ?